We’d love your help. Let us know what’s wrong with this preview of Smiley's People by John le Carré. To ask other readers questions about Smiley's People, please sign up. Do I have to read the Honorable Schoolboy before reading this book? David Talley No. Maybe read Bk 1 (Tinker, Tailor,...) to establish the characters and premise but Bk 2 adds very little to the overall story. If you have ever been curious about exploring John Le Carré’s writing, this Trilogy (titles listed in order in the next paragraph) from his George Smiley series would be a great place to launch from. I learned in the author’s notes that his intention was to continue the conflict story between George Smiley and the head of Russia’s most top secret intelligence agency for several novels. However, T.V. and movies got in the way – the key characters had become so closely associated with the actors w If you have ever been curious about exploring John Le Carré’s writing, this Trilogy (titles listed in order in the next paragraph) from his George Smiley series would be a great place to launch from. I learned in the author’s notes that his intention was to continue the conflict story between George Smiley and the head of Russia’s most top secret intelligence agency for several novels. However, T.V. and movies got in the way – the key characters had become so closely associated with the actors who played them that John Le Carré started to lose sight of his own vision of them. He then decided to close that arc with this novel, although there are still two more books in the George Smiley series. I can’t wait to find out what they are about! For this trilogy summary, I am going to borrow some Paulingo (Paul’s lingo): It’s the bottom of the 9th and the score is 0 – 0. Tinker, Tailor, Soldier, Spy is on second base and The Honourable Schoolboy is on first. 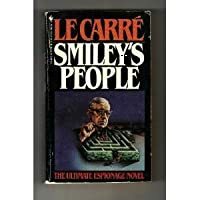 Along comes Smiley's People and John Le Carré hits it out of the ballpark and brings them all home in a 3 – 0 win for the good guys! This story is remarkable as the plot is both intricate and meticulous while at the same time filled with intrigue and fascinating characters who carry it forward. This was a truly memorable story and although I would love to write more, it would be impossible without spoilers. And so on. Don't get me wrong, I love this stuff – but it's a game, it's amusing, it's manifestly nonsense. The thrill of what le Carré does in the Karla trilogy – and I don't believe anyone does it better – is of a completely different order. You believe it: the leaps of intuition are logical and motivated, and just slightly out of your reach, so that you constantly feel both flattered to be keeping up and somewhat awestruck at how they always make the connections a bit faster than you do. It's rather like how I feel when I play through top-level chess games, the sense that you can just about follow why they're doing what they're doing; the deceptive conviction, as you watch an unexpected rook sacrifice, that it all makes perfect sense and that you would undoubtedly have thought of the same move yourself. This is hard to do as a writer. Because writers are often not that smart, even when they're talented. Le Carré writes as though he's smarter than all his readers, and when I read him I'm convinced. The thrills in these books come not from action sequences, but from the plausibility of the dialogue: I was more on edge during Smiley's calm ‘interrogation’ of Toby Esterhase here than I've been in any number of car chase or bomb-defusion scenes. What to say next? How to press them in exactly the right way, without scaring them off? In a sense this book is composed simply of a number of these intense, magesterially-written duologues stacked together, a stichomythic layer-cake: Smiley and Lacon, Smiley and Mikhel, Smiley and Esterhase, Smiley and Connie, Smiley and Grigoriev, Smiley and Alexandra…and always, at the end, the prospect of somehow reaching the the endgame conversation, between Smiley and Karla. (It would be quiet and undramatic, and fascinating.) But then again, the whole trilogy is that conversation being played out. Note for completists: This is the third of the Karla books, preceded by first Tinker, Tailor, Soldier, Spy and then by The Honourable Schoolboy. While it is possible to read these books out of order and still enjoy them, the later books are informed by the events that come before and definitely spoil salient plot points of those novels. Life has not been overly kind to George Smiley. Devoted husband to a faithless wife, dedicated servant to a government that does not admit he exists, archnemesis Note for completists: This is the third of the Karla books, preceded by first Tinker, Tailor, Soldier, Spy and then by The Honourable Schoolboy. While it is possible to read these books out of order and still enjoy them, the later books are informed by the events that come before and definitely spoil salient plot points of those novels. Life has not been overly kind to George Smiley. Devoted husband to a faithless wife, dedicated servant to a government that does not admit he exists, archnemesis to his Soviet doppelganger, betrayed by his closest friend- Smiley has been through much in his years of service. Smiley's People finds the former spymaster once more cast out of the Circus of British intelligence, yet another sacrifice to the twisting winds of political favoritism. Prematurely aged and tired from a life lived in the shadows, Smiley doesn't quite know how to go about existing without subterfuge. Yet when his old acquaintance Lacon shows up requesting Smiley's help investigating the murder of a friend and former asset, Smiley laboriously pulls himself from his over-stuffed easy chair, smoothes rumpled clothes over his mammoth stomach, puts on his horse blanket of a jacket, and tromps dutifully back into the world of intrigue that is his life. At stake is the opportunity to finally take down Karla, the Soviet spymaster who has bedevilled Smiley for decades in the great and secret chess game they have played against one another. Working unofficially, completely off the books and deniable, Smiley must piece together Karla's plan before more of his friends end up dead on a rainy night. Fortunately, Smiley has built up all the resources he would need over a lifetime of intelligence work. In the spy game, all the fancy gadgets and gizmos in the world will never compare to a solid piece of human intel, and Smiley knows just who to ask to get the information he requires. Visiting retired Circus personnel, from the senile research assistant who helped compile nearly all of the known data on Karla to the disgraced lamplighter Toby Esterhase, who can still muster more than a few surveillance teams if there's the chance for personal glory and a return to the game, Smiley pieces together the bits of story he needs in order to weave a trap of his own and conclusively win in the battle of wills that he and Karla have fought for nearly their whole lives. This is what le Carre excels at: the slow and methodical piecing together of events, some decades old, into a coherent conspiracy that has a very real effect on the present. Field work doesn't play too large of a part in Smiley's methodology. He already has most of the puzzle pieces in his hands, it just takes a careful review for Smiley to uncover the importance of each nugget of knowledge. Some readers deride this as moving too slowly, but to them I recommend the works of Robert Ludlum. Smiley is British, and if Monty Python taught us anything it's that the Brits love their dry subtlety. The reader is left even more in the dark than Smiley himself and half the fun of the book is trying to trace those connections between events and characters and (possibly) beat Smiley to his final showdown with Karla. The conclusion of the trilogy that starts with Tinker Tailor Soldier Spy; but, while that book is about betrayal, this one is about manipulation. The heartbreaking message is that, when you want to manipulate someone, the most effective approach is not to try and exploit their weaknesses. Needless to say, that can work too. But the very best way is to exploit their kindness, their decency, and the things that make them a worthwhile human being. It's been done in many other books too, of course, The conclusion of the trilogy that starts with Tinker Tailor Soldier Spy; but, while that book is about betrayal, this one is about manipulation. The heartbreaking message is that, when you want to manipulate someone, the most effective approach is not to try and exploit their weaknesses. Needless to say, that can work too. But the very best way is to exploit their kindness, their decency, and the things that make them a worthwhile human being. It's been done in many other books too, of course, though rarely as well as le Carré does it here. This book changed my life. My dad, sick of hearing me make fun of his spy novel proclivities, bet me $50 that I would love this book. It was a safe bet, too. If I loved it, I owed him nothing other than the smug satisfaction of having been right. If I hated it, he'd give me $50. I loved it. I love the entire trilogy, in fact, but since I read this one first, out of order (tsk tsk dad) it has the special place on my favorites shelf. And even though I now own THREE copies, this edition was my fathe This book changed my life. My dad, sick of hearing me make fun of his spy novel proclivities, bet me $50 that I would love this book. It was a safe bet, too. If I loved it, I owed him nothing other than the smug satisfaction of having been right. If I hated it, he'd give me $50. The best of the best ... everything a spy novel could possibly be ... Smiley vs Karla ... a weakness, a mistake, a brilliantly orchestrated response ... and of course the bridge into West Berlin. Smiley's People is also a master class in writing ... when to expand, when to move quickly, setting a scene, using peripheral characters. I think I'll read it again. But for now, I will go into my class next week at Oxford - British Spies in Fact and Fiction - as prepared as I can be and ready to learn m The best of the best ... everything a spy novel could possibly be ... Smiley vs Karla ... a weakness, a mistake, a brilliantly orchestrated response ... and of course the bridge into West Berlin. Smiley’s People is the last book in the “Karla Trilogy”; a series that describes the world of espionage during the Cold War. The story starts with a revelation by a ‘lost-agent’ recently resurfaced that at the very top of Circus (British secret service) there is a KGB agent, a mole spying for the Russians. And he is there for decades. Dangerous, resourceful and one of their own, this double-agent is capable of wrecking havoc if he isn’t caught immediately and off-guard. Here Smiley is called bac Smiley’s People is the last book in the “Karla Trilogy”; a series that describes the world of espionage during the Cold War. The story starts with a revelation by a ‘lost-agent’ recently resurfaced that at the very top of Circus (British secret service) there is a KGB agent, a mole spying for the Russians. And he is there for decades. Dangerous, resourceful and one of their own, this double-agent is capable of wrecking havoc if he isn’t caught immediately and off-guard. Here Smiley is called back from Retirement to spy on a spy, to draw a web inside the web and then patiently wait for him to walk into the trap. From the offset the language of the book has marked “British-ness” to it, the slang, the jargon and even the sense of humour. As the story proceeds, the thrill of the game intensifies and one cannot help but admire Le Carré’s mastery. The second book, though not as a charming as the first one, had a very different tone and setting. I found it slightly ‘dragging’ at times, but the writing was so enchanting that one can hardly complain. The third and the final book, pits Smiley and his arch-rival Karla against each other. The story, unlike the first two books, kicks off from a very thrilling start and keeps the reader on edge. Le Carré has a singular talent for story telling, and a keen eye for the details. He registers every flinch of fingers, every shift in tone of voice or demeanour and then describes it so perfectly that the reader can visualize the whole scene. His insights on the thoughts of a mind under extreme duress, the art of interrogation and reading of small signs in one’s body language are worth an entire book in itself. There are some recurring themes present throughout the trilogy. Themes like Betrayal, Sexual frustration, promiscuity and love. There is a general mood of futility to the storyline, a sense of unending trepidation and unrequitedness. Maybe its not unique to just this series but is true for most of his fiction (A most wanted man, our kind of Traitor…) where there are no complete victories. The success is always short of triumph, always incomplete or inadequate. But what really piqued my attention was how painfully all the romantic entanglements concluded, and how pessimistic a view the author takes to such storylines. Ricky Tarr, Smiley, Jerry and Karla, all of these men were hopeless lovers, and love was their downfall. Love, in Le Carré’s fiction proves to be, as Karla called it, “an illusion”. Smiley comes out of retirement was his people come under attack in this aptly named conclusion to the Karla trilogy. This is fantastic stuff! Taut tension, high stakes, personal vendettas...ah, it's all wonderful. The characterizations and conversations are finessed with an admirable subtly. The Cold War settings descriptions put you in the middle of these depressingly drab locations. John le Carré is on fire in Smiley's People! It's far more cerebral cold war spy novel than say Fleming's stuff. T Smiley comes out of retirement was his people come under attack in this aptly named conclusion to the Karla trilogy. Normally pretty stingy with handing out 5 star ratings but this was a terrific read and a satisfying conclusion to the Karla trilogy. Such an interesting character George Smiley, a master spy wonderfully depicted in this conclusion. An espionage novel that ticked all of the boxes that I look for in this genre. A novel of disillusionment, betrayal and love. Another from the Boxall 1000 list, time and money well spent. 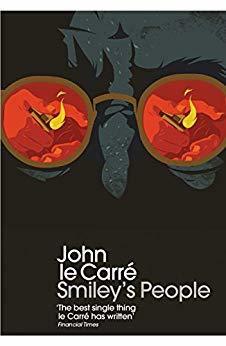 Description: John le Carre's classic novels deftly navigate readers through the intricate shadow worlds of international espionage with unsurpassed skill and knowledge and have earned him -- and his hero, British Secret Service agent George Smiley -- unprecedented worldwide acclaim.Rounding off his astonishing vision of a clandestine world, master storyteller le Carre perfects his art in "Smiley's People." This is my absolute favorite le Carre novel--and in my view the best of the Karla Trilogy. All the cerebral incisiveness of Tinker, Taylor, married to a well-constructed, suspenseful, and active plot. A real crescendo of a novel. I've been watching Roberto Rossellini's The Age of the Medici this afternoon. Or about the middle two and a half hours of the four hour long 'mini-series'. I've been really enjoying it and surprisingly I haven't gotten too distracted watching it (this is something of a rarity for me in the past two years or so, I can probably using my fingers and toes all of the movies I've been able to make it through since the start of 2009). It's made me wonder though why the thought of watching movies leave I've been watching Roberto Rossellini's The Age of the Medici this afternoon. Or about the middle two and a half hours of the four hour long 'mini-series'. I've been really enjoying it and surprisingly I haven't gotten too distracted watching it (this is something of a rarity for me in the past two years or so, I can probably using my fingers and toes all of the movies I've been able to make it through since the start of 2009). It's made me wonder though why the thought of watching movies leave me so blah lately. Partly, I think I might have overdosed on movies in my maniacal attempt to watch the entire Criterion Collection, when I would watch up to three movies a day and feel extremely anxious if anything was going to come between me and the times I designated as 'must watch more films' time. Instead I've traded in obsessive movie watching with abnormally large amounts of reading for embarrassingly abnormal amounts of reading, no movies, and a handful of tv shows that I half heartedly try to keep up with. On of the plus sides of almost never watching movies anymore is that the ones I do find myself actually watching probably are more impressive to me than they would be if I were watching a lot of films. Unlike many of my goodreads.com friends, I can't talk intelligently about movies, there are things I like and things I don't like and even though I have somewhat pretentious, or snobbish, or highbrow tastes I can do little to articulate why I like a movie. Part of it is that movies don't inspire my thoughts like books do, another is that I don't think I really get or like the principle language of film. The more literary directors, like Bergman I could probably talk about but it would be using the language of books to say what I like or how I think the film works. That is what I'm enjoying about The Age of the Medici the way that Rossellini is moving the story and ideas along not by action but by words. The film is visually interesting with the lavish depiction of Renaissance Florence, but the narrative moves like a cross between the party goers of James Joyce's "The Dead" and the espionage novels of John Le Carre. Le Carre writes the anthesis spy novel's as compared to someone like Robert Ludlum or what I imagine Ian Fleming's novels to be like. His hero in this trilogy of novels is George Smiley, a person who is the exact opposite of what the movie version of James Bond is. Smiley is a short fat man. He's unremarkable looking. He has a beautiful wife who is always openly sleeping with other men (she has at least 11 regulars she is sleeping with and a second tier group that she can turn to). When Smiley is at his best in working a case the description of him is bored looking and at times other characters aren't sure if Smiley is awake or asleep. With all of these not so appealing traits he is also one of the most effective caseworkers in The Circus (the British Intelligence or Spy business). There is some action that occurs in the Smiley books but it is almost always told in dialog. Rarely does the reader see the big events, rather they are presented them the same way that Smiley receives most of them through briefings, reports conversations and interrogations. Le Carre does a fantastic job at creating a lush espionage world through mundane activities. There are no racing speed boats and high speed car chases through exotic streets, instead there are subtle moves and operations set up to try to out maneuver the Soviet spymaster Karla. In a TV analogy the espionage world of Le Carre in the Smiley novels (of which, I should have mentioned earlier, this is the conclusion to a trilogy) is like "The Wire" or, sort of, "Homicide", as opposed to any of the hour long police procedurals with their fast resolution and instant results (and I guess that makes Smiley sort of a fat, short, white Lester). The slow meticulous unfolding and the little details in both the shows mentioned and the Smiley novels might seem a little labored at points but their end payoff is greater than the 44 minute resolution of "CSI" or say a James Bond film. A movie was made based on this book and it's available at YouTube, with Alec Guinness, Curd Jürgens, Eileen Atkins. Ο Carre ξέρει να χτίζει χαρακτήρες. Και -δεδομένου ότι δούλεψε κάποια χρόνια ως πράκτορας των βρετανικών μυστικών υπηρεσιών- έφτιαξε "αληθινούς" χαρακτήρες και οι περιγραφές που δίνει για την περίοδο του Ψυχρού Πολέμου (ποτέ δεν μου άρεσε αυτός ο όρος) είναι ρεαλιστικές. Εδώ βλέπεις ανθρώπους που δεν ξέρουν για ποιον δουλεύουν πραγματικά και ανθρώπους που νιώθουν χαμένοι, παρά τη νίκη τους. Κάπου στο βιβλίο μου έμεινε η φράση "Έχασαν αυτοί που έπρεπε να χάσουν, κέρδισαν όμως αυτοί που δεν έπρεπε Ο Carre ξέρει να χτίζει χαρακτήρες. Και -δεδομένου ότι δούλεψε κάποια χρόνια ως πράκτορας των βρετανικών μυστικών υπηρεσιών- έφτιαξε "αληθινούς" χαρακτήρες και οι περιγραφές που δίνει για την περίοδο του Ψυχρού Πολέμου (ποτέ δεν μου άρεσε αυτός ο όρος) είναι ρεαλιστικές. Εδώ βλέπεις ανθρώπους που δεν ξέρουν για ποιον δουλεύουν πραγματικά και ανθρώπους που νιώθουν χαμένοι, παρά τη νίκη τους. Κάπου στο βιβλίο μου έμεινε η φράση "Έχασαν αυτοί που έπρεπε να χάσουν, κέρδισαν όμως αυτοί που δεν έπρεπε να κερδίσουν. "Ένα σκοτεινό και απαισιόδοξο βιβλίο. Στα συν του βιβλίου, η πολύ καλή μετάφραση. By the time I reached the end of this book, I cared so deeply for the characters whom John LeCarre had created that I could not believe it was over. I immediately started reading it again. This is definitely a book not to be read out of sequence, because the deeper nuances of the characters will be lost without having read the earlier books. I thoroughly enjoyed this book, and highly recommend it. In the spy genre, if James Bond is a boxing match, then George Smiley is a chess game. Lots of planning ahead, knowing your opponent, and biding your time to make the right move. Smiley and Karla match wits again, but George has a new advantage—Karla can no longer manipulate him via his wife. Fans of fist fights and gun battles may find this boring. People like myself, who have spent many years researching and working within libraries and archives, will find ourselves mesmerized as Smiley reads files and interviews other ex-employees of the intelligence services in order to build the perfect mousetrap. The first thing I have to say is IF YOU HAVEN'T READ THE FIRST TWO BOOKS IN THE TRILOGY, DON'T EVEN THINK ABOUT READING THIS BOOK! Okay, sorry 'bout the all caps, but you cannot possibly read this book in isolation and enjoy it in the way that it was meant to be savored and enjoyed. This is the ultimate book in a trilogy, and all the pieces come together, characters deepen, brief glimpses of characters and places make sense, and the hard work that you've done to get to this point because of le Ca The first thing I have to say is IF YOU HAVEN'T READ THE FIRST TWO BOOKS IN THE TRILOGY, DON'T EVEN THINK ABOUT READING THIS BOOK! Okay, sorry 'bout the all caps, but you cannot possibly read this book in isolation and enjoy it in the way that it was meant to be savored and enjoyed. This is the ultimate book in a trilogy, and all the pieces come together, characters deepen, brief glimpses of characters and places make sense, and the hard work that you've done to get to this point because of le Carre's dense, dense writing finally pays off. This is great stuff. The Smiley trilogy (Tinker, Tailor, Soldier, Spy; The Honourable Schoolboy and this one) require so much work to get through and understand. le Carre does almost all showing and no telling and because of this I spent about 2/3 of Tinker, Tailor, Soldier, Spy just wondering what the heck was going on. Once I got to this book, I was throwing the lingo around like the best of those "circus" spies and saying things to my husband like, "I'm not sure if I like the housekeepers or the lamplighters better, but I sure know that Connie Sachs is brilliant!" I think he had to pick up the books just to understand me. So, to the story in this one. A murder in the middle of the night spurs a phone call to retired British secret agent George Smiley. He's grumpy and irascible, but no one works the pavement like him. MI6 promises to deny everything if anyone suspects that they're involved, so George has to go it alone (along with the help of his other retired friends) as he works along the skeins of a very tangled cobweb. Fortunately, the skeins seem to lead to his archnemesis Karla. türünün çok iyi bir örneği. serinin diğer kitaplarını da okumayı düşünüyorum. This is probably the most fulfilling of the Smiley stories. But it does follow the usual format. Something happens. Smiley is pulled out of retirement. He talks to his old contacts/colleagues. He reads a lot of files. There are lots of words as the story rolls slowly along. Then in the last 20 pages the denouement occurs where the final act is not known till the last page. This was stunning - quite possibly a perfect novel. It would almost be an insult to describe it as a great example of its genre, for le Carre is such a splendid writer that he elevates his tales of espionage to the level of true literature. While other of his works exhibit the slight flaw (in the case of Tinker, Tailor it was more than slight) of an overly-complex plot, here le Carre keeps things just simple enough that the reader can keep up without too much difficulty. The "tradecraft" is stil This was stunning - quite possibly a perfect novel. It would almost be an insult to describe it as a great example of its genre, for le Carre is such a splendid writer that he elevates his tales of espionage to the level of true literature. While other of his works exhibit the slight flaw (in the case of Tinker, Tailor it was more than slight) of an overly-complex plot, here le Carre keeps things just simple enough that the reader can keep up without too much difficulty. The "tradecraft" is still here, and indeed has rarely been more exhilarating, but the result of this more straightforward narrative is that the reader can engage more fully with the beauty of the writing. There is imagery here that is so lucid that as a reader you cannot help but share it with the person nearest you (in my case, it was my girlfriend). The psychological torments of George Smiley are described in such bitter detail that my stomach churned, my mind fraught with the possibility that things could still go horribly wrong. It is truly an incredible book, and my only regret is that for the reader uninitiated with John le Carre's writing I would not recommend this as the starting point. Though I think it would be possible to follow along and enjoy it as a standalone novel, it ultimately was written as the conclusion to a trilogy. I cannot help but feel that I would not have experienced the full emotional impact if I were not familiar with the previous episodes which inform the feelings contained therein. Just re-read this one after many years. I forgot how awesome this book is. Le Carre was at the top of his game. First, there's Smiley, his heavy-lidded contemplation of what makes people tick. Then there's his people--the lamplighters, the mothers, the housekeepers and the wranglers. The lead-up to the big catch is perfectly done. It's funny, and suspenseful and gives you a thrill without big shoot-em-ups or special effects. Maria Ostrakova is a wonderfully drawn character who carries the early p Just re-read this one after many years. I forgot how awesome this book is. Le Carre was at the top of his game. Maria Ostrakova is a wonderfully drawn character who carries the early part of the story well. And then there's the tensely beautiful scene with Connie Sachs from whom Smiley gets the connection he needs to root out his old foe. There's something else in this era of Le Carre books - that kind of tatty dignified honour coming out of the war, contrasted with awful betrayal under a veneer of old boy. I read this book and Le Carre's others pretty much as they came out. And since I was still in elementary school/junior high around this time, they really made an impression on me about how smart people (and Smiley's spies are smart people) think, and how cool it is to be flip under pressure, and how heartbreaking it can be to be an idealist. A stunning work, even better than the excellent Tinker, Tailor. Smiley's intelligence is portraid in the cracks in between action. The progress of his investigation is subtle; this isn't anything like a modern spy thriller. No car chases, no galavanting around the world. Although this is a book that's ostensibly about the cold war, its themes still resonate. How far is too far when it comes to pursuing enemies? What really differentiates us? I don't want to say too much, but I can't recommend thi A stunning work, even better than the excellent Tinker, Tailor. The last of the sequence of George Smiley tales in which Smiley acting alone achieves a sort of resolution by using Karla's methods against him. The way in which this tale unfolds is masterful. Le Carre has his total command of his characters and the interplay and unfolding of the plot is a joy to behold. My favourite le Carre ever. I was completely engrossed as Smiley starts his investigation and with amazing doggedness, rigor and an ability to see the connections between between seemingly small anomolies brings him to his arch rival. This completes the trilogy (Tinker, Tailor, Soldier, Spy; The Honourable School Boy; Smiley’s People) often known as the Karla Trilogy. Each novel concentrates on a different espionage trait: betrayal, trust and loyalty; and manipulation. This novel is the ultimate manipulation against Smiley’s bete noire. It has become an obsession for him, an unhealthy one that can easily go pear-shaped; for some characters it does. Of the three I enjoyed this one the most. Tinker et al is the most popular, but This completes the trilogy (Tinker, Tailor, Soldier, Spy; The Honourable School Boy; Smiley’s People) often known as the Karla Trilogy. Each novel concentrates on a different espionage trait: betrayal, trust and loyalty; and manipulation. This novel is the ultimate manipulation against Smiley’s bete noire. It has become an obsession for him, an unhealthy one that can easily go pear-shaped; for some characters it does. Of the three I enjoyed this one the most. Tinker et al is the most popular, but I found it the most dense; the unloved middle child is despised for its almost lack of action. However, it is more a slow fuse, and after the destruction resulting from the denouement from the conclusion of the 1st novel, I felt it all made sense – you are not going to continue complete normal workings after that Blitz like exposure. And it is going to have an effect – that effect is played out in Honourable School Boy. In this 3rd novel, we have a Circus taking a different tack – one that is controlled by politicians and bureaucrats; surprisingly (!) causing staff to wallow in procedure and policy and not actually any espionage. I did laugh after those scenes and comments; they were quite bitchy. This 3rd seems, to me, to racket along at a great pace. I was surprised how I devoured that 100 pages on a sunny winter’s Saturday afternoon. However, it is still writing in that elegant, languid Le Carre style. What I love about the Circus series of novels (and I have written this before) is the grimy, ORDINARINESS of the espionage. Rather than fabulous locales, exotic women and exciting car chases, we have: bland flats with gasping gas heaters; smart, eccentric characters, but very ordinary Coronation Street like in outward appearance (the scene with Hilary & Connie was delightful): and a hero that puffs for breath when he climbs to the top floor of a London townhouse. Smiley is such a bland man, but it is his intelligence that comes across as attractive. I do believe that he can observe those nuances, compute their meaning and then use it to his advantage. I remember visits in the 70s to Britain and I remember all this relentless grey, even on the sunniest day. Most of the Deadly Sins come into play here, and are manipulated so that Smiley gets what he wants. They are sordid and are treated as such – even the manipulations are sordid. Finally, I started to think – who is manipulating who. I never believed the sudden slip ups Karla makes in his choices of mule and case-man. Was he manipulating Smiley to get what he wanted? Does Smiley think this as well? You don’t truly know, but it is a ponderable. I did feel some pity for Smiley in those last pages. The chase of the hunt is often more exciting than the final capture; and has he been used as a dupe. Le Carre did a fine job in carrying this trilogy to the end, making each book stand alone, but also as a over-arching series. I think they are worthwhile pursuing. As far as modern fiction storytelling is concerned, I feel there's a strong technical reason why espionage is better-suited than any other genre (if we must perforce label it a genre) for the purposes of an author's narration. First-person psychological realism of course, is the most powerful form of fiction narration --and you can find that rigorous and difficult metier' in many --many of the best ever--mainstream dramatic novels. But in any 'lesser' yarn--the yarns which dominate the more popu As far as modern fiction storytelling is concerned, I feel there's a strong technical reason why espionage is better-suited than any other genre (if we must perforce label it a genre) for the purposes of an author's narration. First-person psychological realism of course, is the most powerful form of fiction narration --and you can find that rigorous and difficult metier' in many --many of the best ever--mainstream dramatic novels. But in any 'lesser' yarn--the yarns which dominate the more popular, entertainment-novel marketplace-- what comes closest to that paradigm is a kind of 'heightened awareness' or 'heightened sensitivity' that really, only espionage affords. Certainly romance, horror, sci-fi, war, fantasy, nor westerns do not place any additional narrating tools in the author's hand. But espionage (especially espionage the way LeCarre always depicted it) relies on a greatly-magnified social perspective between all the characters involved in the story; which you just cannot encounter in any other style of read. The figures in a LeCarre story are just about as tuned-in as characters can get to each other. Why? Because of their profession. They're working shoulder-to-shoulder in a field where everyone needs must 'have their antennae fully extended' to the slightest nuance from their colleague; or their professional contacts; their families and close friends, and even (especially) their lovers. As LeCarre's creations go about their workaday lives--carrying out this-or-that official duty or mission or ||||||||--there is always a sectioned-off-zone of their attention-span which sifts through all of this info which floats past them during their day. Even on ||||||||; they MUST evaluate what their co-worker muttered-in-passing at lunch last week; or who's signature was scrawled on some memo; whose superior approved what expenditure; which indiscreet office fling is making the secretaries titter. Any of these nuances might indicate a leak, a mole, a vulnerability. Thus, huge fodder for the novelist. There is nothing better for fiction than characters who are deeply intermingled with each other; and in espionage fiction it is already provided by dint of the professional practice itself. Then there is also this next interesting aspect. Le Carre in particular is a master at 'circular' or 'layered' foreshadowing. Here's how it functions. ~S. reads a report initialed by M., R., & T.
~They indicate in a follow-up memo that a background check of W. is called for. ~S. wonders whether he should send someone to interview W's parents. ~T. comes to S. and asks him if S. has thought about what W's parents might have to say. Is anyone planning to interview them? When was the last time anyone spoke to them? ~S. pretends he hasn't considered it. ~M. & R. invite S. to lunch; and during lunch, L. appears. After lunch L. draws S. aside and mentions that he has heard he may be chosen to handle an upcoming interview. ~S. casually inquires how he came to that conclusion. ~L. says one of R.'s friends told him. ~S. remembers R. and T. still keep in touch. ~S. arranges the background check of W and assigns K. to handle it. ~At last--finally--K. goes out of town to conduct the interview. See what I mean? Look at how much weight is placed on an event which might only take place many chapters later. In the meantime, all the characters talk about it, whisper about it, think about it, worry about it. You will find this technique in spades, in 'Smiley's People' and many others in just about any product from John leCarre. This is what makes him the premiere novelist of any genre ongoing today. He's on the first tier down from the more thorny, more esoteric powerhouses like Philip Roth, John Updike, Saul Bellow, etc. But he's great in his own way. See, there's foreshadowing and then there's foreshadowing. What LeCarre does is just outlandish. And only in an espionage novel do you get these languorous, lazy, circuitous steps eventually-shuffling-around-to the next plot point. In the time it takes an event to evolve, you get a bunch of characters who are all absolutely riveted upon one another. You get characters who listen and sift through everything their fellows might be suggesting, implying, half-intending. This is the bread'n'butter of the novelist: conversations and dialog. Nowhere else is it as vital, as it is in a work of espionage fiction. And leCarre deploys this technique the way a lead violinist wields his bow over a Bach partita in the Royal Albert Hall. When you read the superb 'Smiley's People'--capstone to the amazing 'Karla' sequence (five installments) these are a few things to keep in mind. 'People' is not a lengthy book; but it is deft. LeCarre was in complete command of his craftsmanship here. It's a softly-told yarn; hushed; inward and subdued. But ecstatic in its way. By all means do watch the fantastic BBC adaptation starring Alec Guinness and Michael Lonsdale. A masterpiece and a tour de force of pacing and point of view. What separates Le Carre from his competitors is the depth of humanity he gives his characters. He's so in tune with human nature--the things that drive us and make us who we are--and it shines through in all his people, but most of all in Smiley, of course. If something stands out from this book, its the restraint that Le Carre shows. After all, this is really the culmination of all of Smiley's efforts against Karla, the end of a long A masterpiece and a tour de force of pacing and point of view. What separates Le Carre from his competitors is the depth of humanity he gives his characters. He's so in tune with human nature--the things that drive us and make us who we are--and it shines through in all his people, but most of all in Smiley, of course. If something stands out from this book, its the restraint that Le Carre shows. After all, this is really the culmination of all of Smiley's efforts against Karla, the end of a long and painful war. And yet, in key moments, its not Smiley we're with but Esterhase or Guillam or even Mendel, who doesn't really factor into the action here at all. And when the key moments come, Le Carre draws them out masterfully. I would say that you could read this book without having first read Tinker Tailor, but I think having read that book informed so much about the background here that just the mention of Bill Haydon was sufficient to cast a certain tone over a scene. At any rate, its really a moot point, as you should read both books. To be honest, I couldn't decide which is better, though I enjoyed reading this much more than Tinker Tailor. "He looked across the river into the darkness again, and an unholy vertigo seized him as the very evil he had fought against seemed to reach out and possess him and claim him despite his striving, calling him a traitor also; mocking him, yet at the same time applauding his betrayal. On Karla has descended the curse of Smiley's compassion; on Smiley the curse of Karla's fanaticism. I have destroyed him with the weapons I abhorred, and they are his. We have crossed each other's frontiers, we are t "He looked across the river into the darkness again, and an unholy vertigo seized him as the very evil he had fought against seemed to reach out and possess him and claim him despite his striving, calling him a traitor also; mocking him, yet at the same time applauding his betrayal. On Karla has descended the curse of Smiley's compassion; on Smiley the curse of Karla's fanaticism. I have destroyed him with the weapons I abhorred, and they are his. We have crossed each other's frontiers, we are the no-men, of this no-man's land." So dense. So deliberate, slow, rich, disorienting, obscure--yet, somehow, through some strange magic, through the initial obscurantist density of detail and noise, the patient reader begins to pick up the thread, to see how the facts cohere: Le Carré seems to be able to recreate the slow, patient, methodical work of intelligence agents in the reader's experience of his books. This, like Le Carré's other books, is no page turner that one can race through. It's likely that many who pick up a Le Ca So dense. So deliberate, slow, rich, disorienting, obscure--yet, somehow, through some strange magic, through the initial obscurantist density of detail and noise, the patient reader begins to pick up the thread, to see how the facts cohere: Le Carré seems to be able to recreate the slow, patient, methodical work of intelligence agents in the reader's experience of his books.